Brittany credits the StaRN program on giving her the confidence and knowledge to become a successful nurse, and easing the transition from nursing school to the real world of nursing. StaRN, short for Specialty Training Apprenticeship for Registered Nurses, is a 13-week program that bridges the skills gap between newly-registered and experienced nurses. The program includes classroom instruction, hands-on training, simulation labs, and a clinical preceptorship. Brittany mentions that the simulations were especially helpful, as she could experience stressful scenarios in a controlled environment. This experience and confidence has shown in Brittany's work, leading to her becoming a valued member of the Lawnwood Regional team and play an important role in providing quality patient care. 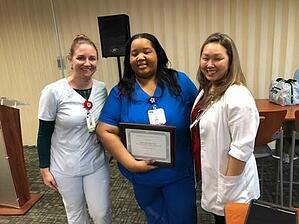 Please join us in congratulating Brittany Nixon on becoming Employee of the Month for December 2018 at Lawnwood Regional Medical Center! If you're interested in joining our team, click here to browse our current job opportunities.